At a conference entitled Patents in Telecoms & the Internet of Things, at George Washington University in the District of Columbia last week, I was perturbed to hear a speaker mischaracterizing the communications standards as platforms of preexisting technologies upon which IoT innovation will occur. Major research and development investments are being made in communications technologies and standards to satisfy the anticipated demands of 5G and IoT. In fact, these investments, with significant innovations resulting already, are largely a leap of faith in advance of hoped-for IoT applications development and proof of demand for these. The intensity of R&D activities and of contributions to the 3GPP standards ebbs and flows somewhat over the years, depending on timing of next-generation standards and the business cycle. R&D expenditures declined somewhat among the largest cellular technology developers following the finalization of 3GPP Release 8 in early 2009. This was also because companies faced increasing financial pressures with the global financial and economic collapse in 2008, and because Ericsson and Nokia divested their handset businesses in 2012 and 2014 respectively. However, R&D levels among the leading players have surged again over the last few years along the development path for 5G, including LTE Advanced Pro and with NB-IOT and Cat-M1 technologies. *Figures are for 12 months to September 2017 and overlap the previous year's by one quarter, except for Qualcomm with its September yearend. ^Huawei has not yet reported figures for periods since 2016-12-31. 2017 figures are conservatively estimated to be the same as in 2016. As I indicated in a previous article for RCR Wireless, most cellular technology R&D investments, contributions to 3GPP standards and standard-essential patents are from a relatively small number of major companies: most notably including Ericsson, Huawei, Nokia (with its acquisition of Alcatel-Lucent) and Qualcomm. Samsung with its more diversified business in semiconductor fabrication and consumer electronics is also significant, as is ZTE and a few others. While attending 5G Americas' annual analyst event, with record attendance in Dallas earlier this month, it was very clear that R&D and standardization-related activity has increased dramatically in the run-up to 5G; including communications platform developments in 3GPP Release 13 and Release 14 with LTE Advanced Pro and LTE-based IoT, as well as with numerous study items for 5G network technologies. In addition to enhancing mobile broadband with increased speeds and capacity, 5G will also enable orders of magnitude more connected devices, some of which will have ultra-reliable and low-latency connections while others will have battery lives extending to many years. 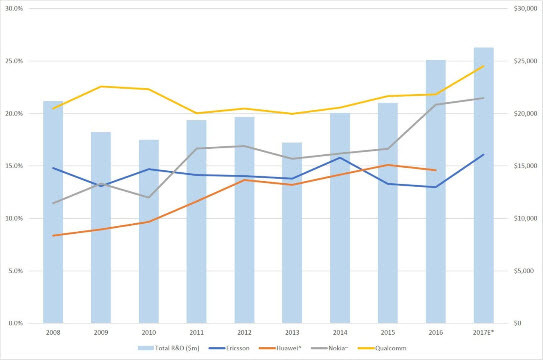 The numbers of contributions to the standards and of standard-essential patent declarations have also declined since the initial standardization of LTE. However, third-party published research on those metrics is typically not yet reflecting the recent uptick with upcoming 5G that is evident with the above R&D figures. A 2015 Signals Research publication shows a temporal peak in approved contributions to standards development 3GPP in Release 8 (2009) with the introduction of LTE, followed by lower levels of activity thereafter. The following chart from the report also shows that there is a new 3GPP release every year or two. The report notes that the top ten contributing companies accounted for 66 percent of all approved submissions. While most of the new technologies for improvements to existing standards and creation of the new 5G standard continue to be largely conceived and developed by relatively few companies, increasing participation in working groups including numerous implementers and observers illustrates the increasing scale, pace and importance of cellular innovation. 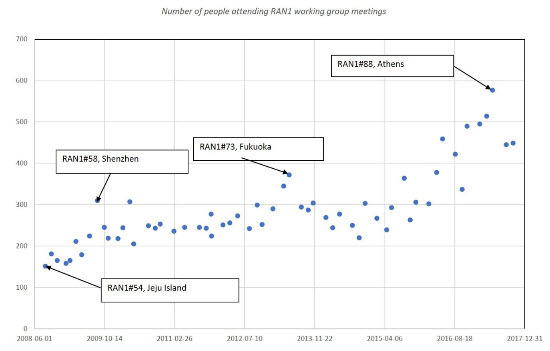 For example, attendance at RAN1 working group meetings - where most of the standard-essential patented technology is adopted among 3GPP working groups- has steadily increased to record levels in the last couple of years. This follows peaks in attendance in 2009 and 2013. The following chart shows this clearly while understating, by omission, additional meetings for 5G New Radio most recently including the June 2017 RAN1-NR#2 meeting in Qingdao with 394 attendees. A 2016 report produced by IPlytics for the European Commission's DG GROW on landscaping SEPs also shows a peak; in numbers of patents declared to the ETSI IPR database by their owners as possibly essential to the 3GPP standards. The report also includes analysis on declared SEPs for the 2G GSM and 3G UMTS standards, but does not and cannot (yet) provide a comparable measure for 5G. Declarations of 5G SEPs will appear in due course following patent applications, as the standard is completed in Release 15 and Release 16, and in subsequent releases. R&D investment in the the standard-essential technologies contributed to 3GPP is a leading indicator of the major technological improvements coming with 5G. A wide variety of applications and "use cases" will be supported with this single standard. 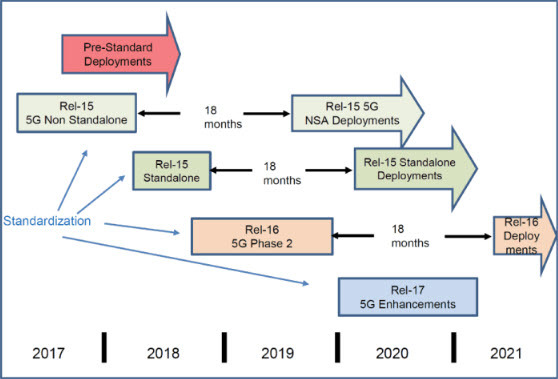 The rising activity levels in 3GPP working groups and in patenting for 5G technologies is occurring in the run up to the first 5G releases, with a standard freeze for 5G non-standalone mode in Release 15 expected early in 2018, and with Release 15 standalone mode and Release 16 expected to be completed in 2018 and 2019 respectively. While many significant SEP-technology developers also implement these technologies in their own products and services, it is increasingly other companies that are capitalizing on this rich and expanding trove of intellectual property. Nokia exited the handset business, after being the market leader with 40 percent share, and Ericsson divested handsets as also indicated above. Increasing shares of the handset business are being taken by OEMs with little or no SEPs. Apple entered the market only a decade ago and leading Chinese OEMs OPPO, vivo and Xiaomi have only entered since 2013. IoT will bring forth an even more diverse set of companies with no history in cellular technologies. While developers seek returns on their financial investments in R&D, implementers want transparency and certainty in their patent licensing costs. Competition authorities and other government agencies, including DG GROW, would like to see notification of rates before implementers sink significant investments in product developments, network builds and service launches. Ericsson disclosed its 5G/NR licensing charges of $2.50 to $5.00 per handset in March 2017. As occurred previously in the run up to LTE standardization nearly one decade ago, expect more licensing-rate disclosures soon for 5G with the upcoming partial freeze of Release 15 including non-standalone mode 5G New Radio expected early in 2018. Keith Mallinson has more than 25 years of experience in the Telecommunications Industry: as a research analyst, consultant and testifying expert witness. Complementing his industry focus, he has a broad skill set including technologies, market analysis, regulation, economics and finance. Prior to founding WiseHarbor in 2006, Mallinson led Yankee Group's global Wireless/Mobile research and consulting team as Executive Vice President, based in Boston, from 2000. 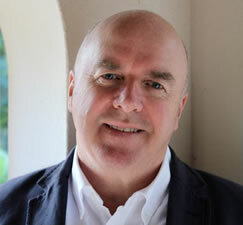 Until then, he had overall responsibility for the firm's European division, as Managing Director from 1995. Prior to that he was the European Research Director.